I’ve got off to a bit of a false start to the New Year. Having first got ill between Christmas and New Year, then recovered, I went down properly with whatever nasty virus it was a couple of days after the obligatory late night party with good friends and board games. (I knew something wasn’t quite right when I needed coffee at 11pm to stay awake to see the new year in & get home safely). Apparently there’s a lot of sickness about at the moment – hopefully you’ve avoided it! False start aside, next week it’s going to be all systems go, with another Sync Songwriting Challenge – this time only 5 days long. If we are producing full tracks in that time, it will be tougher than last time, when we had 8 days, but very rewarding. I’m really looking forward to getting stuck in. The last few weeks have been a time to reflect on the ‘wins’ of 2018, and to consider goals for the new year. Obviously, releasing Survival was a major win – even though it feels like much longer than a year ago, it was only last May. I’ve been pleased with how well some of my songs from the album have been received, and with the feedback for Death Blinked First, the new single I put out in October. The other big musical win for me has been working on my keyboard playing to try to become more proficient, which will give me more options for live performance. (It should also help with recording). I’m not yet at a stage where I would feel confident playing keys in front of an audience, but that is where I want to get to in the next few months – I’ve been using material I pre-prepared so far. I have wanted to be able to play ‘properly’ since I was about 10 years old, and I haven’t ever really cracked it. Earlier attempts have been with a classical approach, learning each hand separately then trying to make them work together, which is where things usually fell apart. This time, I’m approaching it as the guitarist that I am and making it all about the chords, working two-handed from the start to work on songs I already know. The songbooks are the same ones I used when I was learning guitar chords, which show the chord names over the piano part. There has been definite progress! I don’t have any plans to be able to play classical pieces, though. Just to be able to accompany singing with the right chords and improvise around that when the feeling takes me (without hitting any obviously bum notes) would make me very happy. If this approach helps me get to where I can sight-read some easier pieces, even better. Before the drive to improve on keyboard got started, I took up playing mandolin in about mid October. I’ve had the instrument several years since a friend was cutting back on their collection and I couldn’t resist increasing mine. I had never quite got my head (fingers?) around it or put much time into learning the chords before. This time there’s been more of a purpose. I played this in public for the first couple of times just before Christmas, supporting my church’s service and some carol-singing outside a local supermarket. Sure, I made plenty of mistakes, especially at the open air event – my excuse is that my fingers and brain got a bit frozen. It was good fun, though, in spite of the chill, and we all warmed up afterwards with hot drinks and soup. My next big musical win for 2018 was all the collaborations. I still have to complete various projects, but the ones that got finished relatively quickly are already out there and available to listen: my Bean Bag Remix of What Good Are the Stars by Manipulant, and synth work/song development on Durdle Door, by Matt Steady. I have a big ongoing project with some remixes for John Clark and several other smaller projects with other indie artists. Finally, on the personal side, the big win has been the dramatic improvement in Dad’s health since he got out of hospital in February. It’s been great to see him recovering and his determination to get back to normal as far as possible. The icing on the cake was in mid-December, when the GP said he is happy Dad is fit to drive again. We still have some hurdles to jump over, but that milestone really made me feel happy. 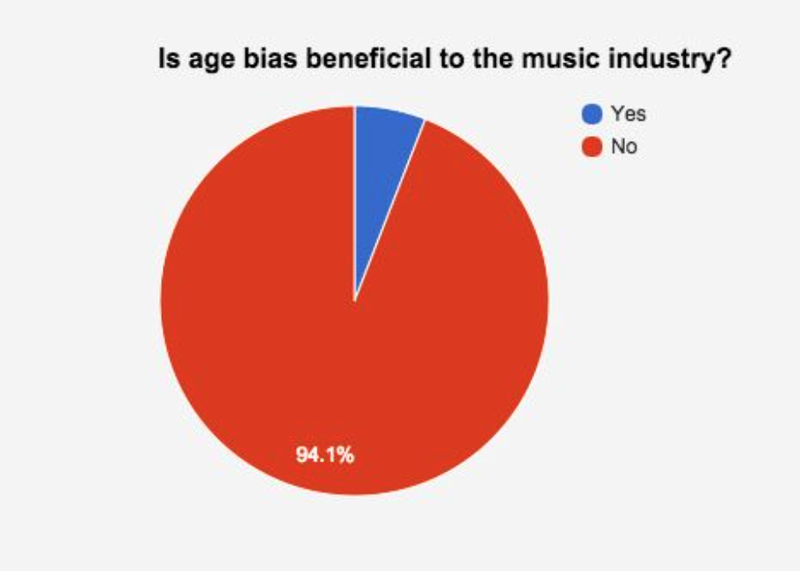 As part of my academic studies, I ran a survey during February concerning perceptions of and attitudes concerning age equality, as it relates to the music industry. It also looked at different ages’ listening habits. I don’t think it was the most scientific study ever, and I’m sure the Radio 4 More or Less team would be able to pick some holes in it, but I think there is at least some indication of the trends. A significant proportion of the responses came through posting requests for responses on Lincolnshire musicians’ facebook sites, but there were also responses from further afield. There may therefore be some regional bias affecting the overall response as a result of the survey’s methodology. All responses were anonymous, though, and the survey did not collect geographical information. Approximately half of participants were music consumers rather than being involved in the music industry to some extent. A huge thankyou to everyone who took the time to fill out the form, making this a much more interesting and fulfilling project to undertake.